Oh the crying… lots and lots of crying. Many parents chalk up all this crying to what they hear and determine their little one has colic. Here’s the thing. Babies cry — some more than others. In fact, all babies have some common fussiness/crying. 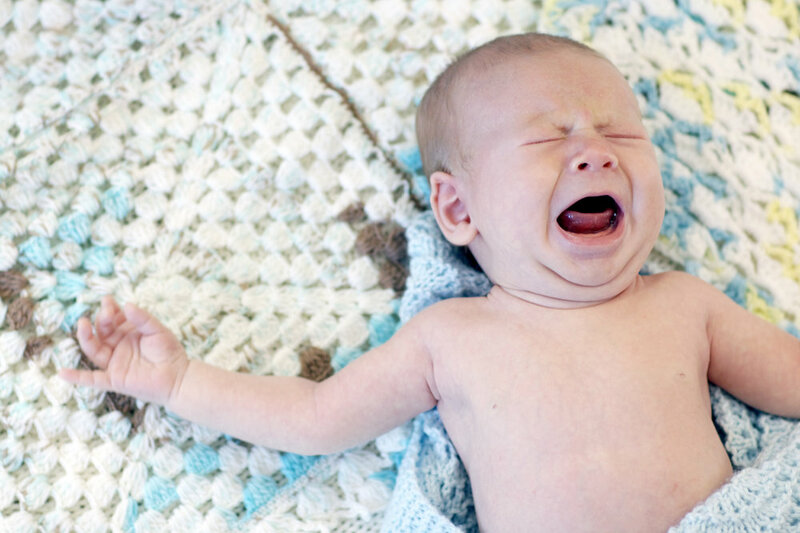 BUT only 20% of babies have extreme fussiness (aka colic). So what actually is colic? If your baby is crying for at least 3 hours a day, 3 days a week, and 3 weeks straight, then your baby has colic. Another way to identify if your baby has colic is when you pick them up to soothe them — whether it’s rocking, bouncing, nursing, etc. Any of these tending love care tactics typically does not help a colicky baby. when does colic present itself? The first signs of colic can appear as early as 1 week of age and peaks at 3 weeks. Around the first month colic is more likely to occur day and night. There is no rhyme or reasons at this stage for when a colicky baby will cry. It can go either or both ways. But then around the 2nd and 3rd month, you will start to see the crying occur more in the evenings. One sign that your little one is on his or her way out of this stage is when daytime fussiness is getting less and less and most fussiness occurs in the evening hours. By 3 months colic is resolved in 80% of babies and by 4 mos it should be resolved. It may feel like forever, but there is a light at the end of the tunnel. If you pick your baby up in the middle of the night when he or she is crying, and they stop crying once picked up, it’s a good sign that it’s not colic anymore. The challenge is to recognize that it is over and that now you most likely have some behavioral sleep associations to work on since all you’ve been trying to do is make your little one the most comfortable you can. The question you might be wondering is if there things you can try to help during this 4 month period? With all that crying, I know you’ll try anything. So, here is the most common thing you can do to TRY and take control of the situation. This may sound crazy, but there was a study from the Journal of Pediatrics on the relationship between cow’s milk allergy and colic. When moms of breastfed infants stopped drinking cows milk, a reduction in colic was noted in more than half of the infants. Also make sure to check all packaged foods ingredient labels for cow dairy — it gets snuck in there sometimes. Cow’s milk, cabbage, cauliflower, broccoli, onion, and chocolate. I was so mad at this list when I had my little one. Two of my favorite things were on this list! But on the bright side, the study says you CAN eat the following: garlic, green peppers, orange juice, brussel sprouts, dried beans, eggs, carrots, beef, and beer. These foods were not associated with colic symptoms, so are given a thumbs up. The latest and greatest “fad” (if you’d like to call it that) are probiotics. Probiotics (in this case Lactobacillus reuteri) is a normal bacteria found in the GI tract and is thought to serve as a protective barrier against harmful bacteria and help your little ones immune system. Moms of colicky babies who were not consuming dairy and were giving their baby probiotics once a day for a month, cried 1 hr 30 minutes less than babies given simethicone (anti-gas drops). And yes, it is safe to give your little one in the appropriate amount. Yep, you heard me. You go on a strict diet taking out the most common food allergens: dairy, soy, wheat, eggs, peanuts, tree nuts, and fish. A study found that breastfed colicky babies whose moms consumed a low-allergen food diet showed significant improvement in colic symptoms compared to babies of moms not on this diet. After 7 days on this diet, these colicky babies were crying 90 minutes less! If it were up to me and my baby was showing signs of colic between the 1–3 week mark, I’d start with no dairy and ask my pediatrician for a probiotic recommendation and dosage. Going balls to the Walls sounds daunting when you’re just trying to keep your head above water with a new baby! There is nothing you personally have done to cause colic. There is a lot to worry about as new parents, but you aren’t doing anything “wrong” if your baby has colic. This is something they kinda just need to grow out of. In fact, we don’t really know what causes colic. Some say it is neurological, some say it has to do with higher levels of seratonin and lower levels of melatonin (which starts to develop around the 3–4mo mark when colic subsides), some link it to gastrointestinal issues — intestinal immaturity/imbalance. This latter reasoning seems most convincing given the studies on colic and dietary intake mentioned above. If you’re you out of the colic phase and find that your baby still needs you to self-soothe, I have a free 15 min initial call you can schedule online if you are looking for some better sleep options.